For centuries the British mainland has been linked to the Continent by ships ferrying passengers across the Dover Straits, which remains the most used route into Britain for cars and trucks, running via Dover itself, Ramsgate, Newhaven and Folkestone. But for those travelling to and from other corners of Britain there are options aplenty elsewhere to save driving: Rosyth near Edinburgh has a service to Zeebrugge in Belgium; Newcastle is linked to Amsterdam; Harwich to Esbjerg in Denmark and The Hook of Holland; Plymouth to Santander in Northern Spain, Portsmouth likewise, but also to Bilbao; and Hull to Rotterdam and Zeebrugge. Britain likes to call itself an island nation. More accurately we're an islands nation. There's the mainland of course, but also Northern Ireland on another landmass; scores of Scottish islands strung round the West Coast and north up to Orkney and Shetland; The Scillies, The Channel Islands, Isle of Man, and don't forget little Lundy. All of them connected by ferry services. Irish tourism has boomed of late. Belfast and Larne just above it have boats running to South West Scotland, Fleetwood, Heysham and Liverpool in North West England, and Douglas on the Isle of Man. For those journeying to and from the Republic, Dublin, Rosslare, Dun Laoghaire and Cork all offer routes to England or Wales. The Scottish islands attract walkers, birders, golfers, climbers, whisky lovers and romantics enthralled by the scenery. Most of those islands are served by ferries operated by Caledonian MacBrayne, though other providers exist beside them. For those island hopping there are multiple use tickets on CalMac worth considering. Ferries, of course, don't necessarily link islands: there are services around our coast like the Sandbanks Ferry across Poole Harbour and the Windermere Ferry across the lake there that can cut miles off a journey; and inland river ferries like the little chain ferry at Reedham in Norfolk, or the Woolwich Free Ferry in London likewise. Foot ferries like that between Fleetwood and Knott End, or from Barmouth to Fairbourne, or across Harwich Harbour can save time for walkers too. There's even a rowboat ferry between Southwold and Walberswick in Suffolk. Don't overdo it in the bar; not only for health reasons, but because alcohol stays in the bloodstream longer than you think and police in ferry ports are aware of the danger of drunks driving off boats. Arriving from the Continent, British or otherwise, don't forget Britain drives on the left. Even Brits get used to driving on the right when away, and early morning arrivals mean you are not at your brightest. A full stomach really does help with seasickness. Don't leave it to the ferry to change currency, rates may not be great. Restaurants on the ferry have limited places, so get there early, or book in advance. Especially at a holiday's end maybe make an occasion of it and dine in the smartest bit. There will be fewer sailings than international ships, and demand varies, so book ahead if possible. Some ferries have good food provision, some don't - a snack in your bag in case is a good idea. If you suffer from seasickness, intra- or international makes no difference, take the same tablets for island hopping, and don't travel on an empty stomach. If taking the car, remember petrol on some islands is not cheap. Don't forget to take pictures from the ferry - some of the views are magnificent. Again, if you forget the camera, or on short trips don't have it ready, you may miss some different views. There may be queues in season or at peak times, so don't work timings out banking to get straight on. Don't forget to have £1 and £2 coins, or at least a £5 note on you - paying a small toll with a £20 note won't impress. Some river ferries have really good old pubs right by them - consider making more of the event by eating there - check them out on this site. Take a moment to consider history: most river ferries run where such services have existed for many centuries. 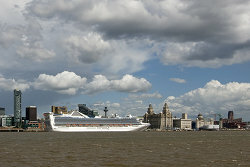 And some are even celebrated in song: "Ferry, cross the Mersey..."